When sixth grade students at Queensview Elementary are assigned community service projects, Derek Knowles-Collier is not keen on his placement. Cemetery duty is NOT his idea of a fun time. Plagued with nightmares from when he was young, Derek worries that being at the cemetery will be too difficult. Together with his group, Derek comes across secret codes and a mystery to be solved that finally brings him some peace. 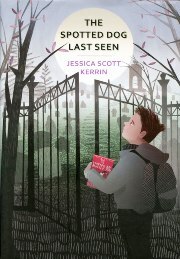 Sad that the kid’s friend dies but a really good book! I love mysterious books! This book was very fascinating.